My last blog questioning what the police are doing to investigate scams has generated some interesting responses. A promise for more information from a senior member of the Victorian police; a response from the ACCC to my query; and someone’s FOI request has given a standard response from the Australian Institute of Criminology (ACIC). Since July the ACIC has had responsibility for ACORN. My blog goes internationally and I also had a lengthy response from Barb, the owner of and a peer counsellor for www.romancescams.org with the comment that similar issues exists in America.. They also runs an online support group for scam victims so they should know. I have also been having ongoing discussions with two individuals currently dealing with ACORN about recent scams. You may have also seen me on the ABC 7:30 Report on Friday night 7/10/2016 though this report talked about a money laundering type of scam. ACORN does nothing that I can ascertain, I was saying in the interview. The response that came to my query [see bottom of last blog post] to ACCC was quite lengthy, mainly talking about the role of ScamWatch, which I had already covered in my last blog. ACORN has now moved to Australian Criminal Intelligence Commission (ACIC) which commenced operation on 1 July 2016. ACIC is “uniquely equipped as Australia’s national criminal intelligence agency with investigative, research and information delivery functions. Our agency works closely with a broad range of national and international partners to strengthen the ability to respond to crime affecting Australia” they state. See the full response to my request to the ACCC for information, and note the sections highlighted in yellow about ACORN’s role. The suggestions here are that reports by scam victims to ACORN will be investigated by the police, which is what victims want, but I note that this is only a ‘possibility‘. There is a clear caveat though, “However, due to the ‘fly by night’ nature of many scammers, it is extremely difficult for government agencies to track them down and take action against them. 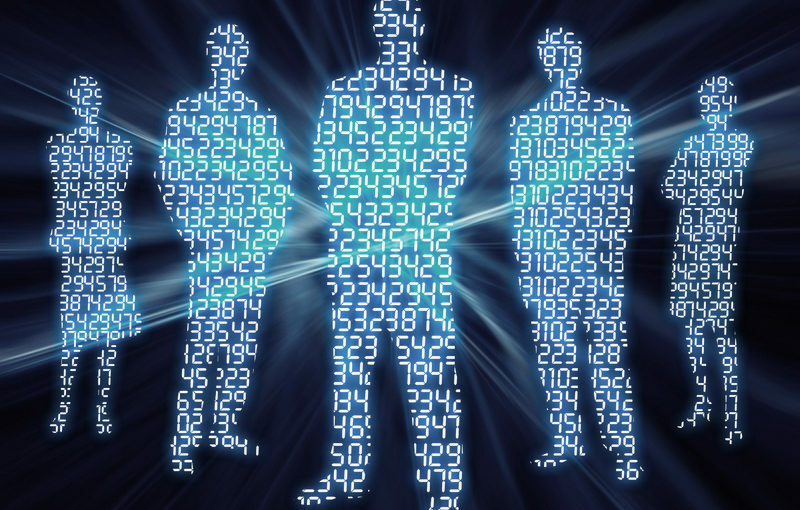 This is further complicated by the fact that most scammers are based overseas.“. My question is “how do they know that it is difficult to track them and take action, when they do not follow up with scam victims to see what information they might have that the police could use”? 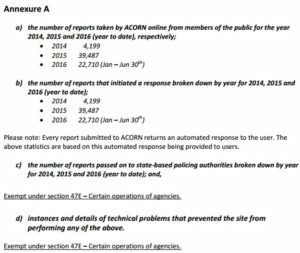 No-one from ACORN or Scamwatch talks to victims that I can ascertain, local police often send victims away laughing at them, and there is no way, apart from a very impersonal online form on ACORN that victims can provide information, let alone talk to anyone to explain what information they have. And this includes in situations where there are ongoing contacts by the scammers after the victim has realised they have been scammed and reported it, ranging from badgering the victim with high volumes of calls and contacts trying to get them to give more money (which could be tracked by the police if they were on the ball), to threats of blackmail with cybersex videos or photos made during the scam. I hear blackmail is the emerging trend in America, and I am certainly seeing it here in Australia too. This ongoing activity by the scammer is time limited, and requires urgent followup by skilled police to be able to make a case and forward it via Interpol to the relevant country (Nigeria?) whilst activities are still ongoing, so the criminals conducting fraud can be caught in the act. There are agencies in Nigeria such as the Economic and Financial Crimes Commission (EFCC), prepared to act if the information is provided. Why is no one bothering? Do they even know they can do this? 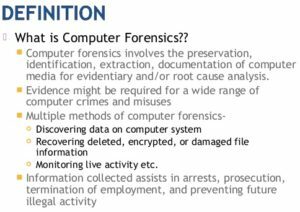 I also question whether they, i.e., ACORN, ACIC or local police fraud squads, have the knowledge and skills in cyber investigation, Cyber Forensics, to actually know what to do with the information that a victim can provide. Skills such as finding the location that the scammer resides in; finding the phone that is being used and who owns it; contacting the banks used to send money too; and finding the owners of these accounts. Some of these a private individual can do using tools available online if they have the know-how, but when one victim passed this information on to the police they did not know what to do with it. What can and do the police do? Where does the investigative skill reside and how does a victim get information to these people? If it was a murder, or a terror threat, or a threat to a business all of these skills would be available and utilised promptly I would suggest. But somehow for scam victims they are not. I have had Private Investigators contact me offering that they can “track down internet fraudsters, help scam victims recover their funds and also help you prosecute the scammer“. If they can surely the police can… or do the Police need to hire people with more skills. Barb from romancescams.org says “Another factor is the costs involved in finding the actual criminals and having them prosecuted. Because of that no one is going to go after a scammer for one individual scam. What the agencies are doing is compiling databases to see if they can link certain scammers to multiple crimes. This again is complicated and has to be done using a lot of cyber forensics. The whole process is long, complicated and can be very expensive.” This maybe what ACORN and/or other parts of ACIC are doing, but we just don’t know. And because they are NOT talking to victims to see what information they have, I suspect they are not. The response to a FOI request (not mine) was not any more illuminating unfortunately. ACIC have only quoted that they have sent automatic responses to victims, and do not give any information on numbers passed to state based or national police agencies. So we are none the wiser. The individual victims I have been speaking to have been very distressed that there is no opportunity to be heard as a victim, let alone see any justice done. Over $50 million was reported lost through scams last year according to the ACCC, and on the ratio of only 10% of scams being reported, that means Australians lost around $500 million! Prevention messages have reduced the numbers, but only marginally. Surely more needs to be done. Victims want justice, but no-one seems to be taking any notice. This is not good enough! Fraud victims deserve better. Please contact me if you would like to be part of a group that works to raise this issue higher, either openly or privately. I am a romance scam victim not residing in Australia but in Hong Kong. I was scammed for US$13,000 and as the last attempt when the scammer(s) knew I wasn’t gonna send them more money they tried to trick me into visiting China to sign off a contract to transfer US$1.7 million. – that’s how I became suspicious. I ran to the police HQ while I was still holding the scammer(s) without letting him/them notice that I now am aware, to offer the police to bait the scammer(s) for US$1.7M money laundering. They completely ignored me. They even said to me that the police in HK are busy catching the mainland Chinese scammers who scam HK companies big time. Which indicates they are not interested in at all for mere romance “individual” victims. What they don’t understand is that, those romance scammers are large global criminal syndicates which possibly connect to the “larger” scammers they are chasing. Later on, since I posted my scammer(s) phone number online, I got a contact from a potential victim who searched the same phone number and found my story. She said she made a call to the phone number she believed it belong to her love interest, and she was answered in the local Chinese dialect (Cantonese) in where the number was supposed to belong to a western guy. Second time she called, was picked up by other guy who answered her in the mainland Chinese (Mandarin) language. Until then I thought the perpetrator(s) were Nigerians. This report indicates that they have a group of local operators, possibly the local criminal gang with the connection of Chinese mainland which works with global criminal syndicates – as the email “he” gave me traces back to Indonesia and Nigeria. Long after I cut the contact with the scammer(s) the police invited me to their HQ to make an official filing of the crime. TOO LATE. For your record, police visited the place I told them it is the address I was given by the scammer(s) – only to find that there was no such person living there. (of course) I am not saying the police did nothing but when I walked to the police HQ all I was doing was offering to corporate with them to catch the scammer(s) insisting that I KNOW I won’t get the money back and that’s not why I came to the police. I didn’t go to the police for a help, I went to the police TO OFFER MY HELP IF they want to catch them. Every time I read about the criminal gang operations in Hong Kong on news outlet, I think of my very own experience. And you are right, POLICE DO NOT TALK TO THE VICTIMS where they can get the best chance to come close to catching the perpetrators. They think it is done by Nigerians far out in African continent but in the reality I think many have operations locally and therefore, it is of their local police job to get involved in. Previous Previous post: What are our police forces doing about romance scammers? ?